Science has helped the human brain to understand its surrounding very precisely which in turn has resulted in numerous discoveries and inventions. These discoveries and inventions have improved the standard of living on this planet and have paved the way for further studies. Science has been divided into different sub-groups based on their concerned area of study. Chemistry is a branch of science that deals with matter, particularly the study of atoms and molecules and the parameters that govern their inter-convertibility. What is Science? This is basically the study of objects, surroundings, and various natural events and their effects based on different observations and experiments. This would explain a systematic and more logical approach towards the changes and their behaviors or events associated with them. Human is curious to know each and everything he can see and sense around him. This curiosity is the reason why he is so eager to understand the things of the world that led to the development of various discoveries and inventions. Further, Science has helped humans to understand the things minutely that further resulted in various discoveries and inventions. Chemistry is the popular branch of science that mainly deals with chemicals, their properties, and the structure. It will also give you an idea of substances or compounds and their interaction with each other. If you would observe closely then you can see there are a lot of differences between Basics of Chemistry and the advanced Chemistry. The concept of Basic Chemistry was proposed in the ancient times by one famous scientist Alchemists. He explained the all basic concepts of the Chemistry that were concluded from a series of experiments and really worked well in the practical life. At the same times, Modern chemistry was proposed in the 17th Century that was designed with an objective of gaining knowledge about the matter. A plenty of theories with justified statements and a series of experiments were also given to show how matter interacts together. 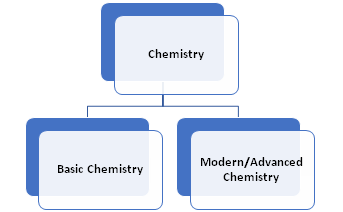 The domain of the Chemistry is mainly related to the study of the composition of matter, its structure, and properties. So, we can say that the fundamentals of matter, atoms, and molecules make the foundation of Chemistry. Today, if you would look at the concept closely then it is able to answer many of the queries in the real world. For example – the quantitative analysis of the numbers of basic constituents of matter i.e. atoms and molecules, and their dependencies with each other is explained well by the Chemistry. The modern Chemistry helping scientists and engineers in harness the true energy associated with atoms and molecules. Well, let me explain to you the concept of Chemistry in little more interesting ways. Today, we are able to preserve the food items for the long time span. There are a plenty of chemicals that are added to manufacture a variety of products. Everything you can see around you is the magic of chemicals when they added together to form an innovative product. Some of the popular uses of Chemistry are – Pasteurized milk, steel construction, photosynthesis, crackers we burn etc. These products are used so frequently in our daily lives that we can’t even imagine our lives without them. This is a popular branch of Chemistry that mainly deals with the study of carbon-based Compounds. This branch of Chemistry usually deals with the behavior, properties, composition, and characteristics of the chemical compound. The other name for the Organic Chemistry is Chemistry of Life. This is another branch of Chemistry that studies about metals, gaseous matter, or materials etc. that don’t contain carbon as an element is called the Inorganic Chemistry. This is always the opposite case of the Organic Chemistry. It includes the combined study of the Physics and Chemistry to explain the chemical systems and popular with the name Physical Chemistry. This branch usually deals with the study of the physical properties of matter and their structure. The subcategories under this branch are quantum Physics and the Thermodynamics. This is a popular branch of Chemistry that deals with chemical processes and takes place in living organisms. This is the most interesting branch of Chemistry that will explain to you the properties of matter, their composition, different substances, and materials. It uses quantitative techniques to identify the physical or chemical properties of the matter. What are the applications of Chemistry? Chemistry is an interesting subject that involves fun and needs a good imagination to understand the deeper insights of the topic. Many students find it hard learning Chemical reactions and their formulas too. So, what is the solution if he/she has missed some class in the classroom? The best idea is to learn Chemistry online to enhance the overall skills of a student. They will definitely enjoy the things when it is learned online.